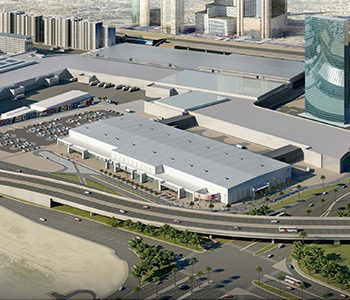 The project is located adjacent to the Za’abeel Halls. With a plot area of 44,510 m², the project includes two standard halls and one sub-dividable supporting hall with adequate supporting amenities for functions and infrastructure works, two connecting halls with retractable walls and a permanent roof that links the new project to Za’abeel Halls 1 and 2. A concourse provides access to the standard halls and the supporting multi-purpose hall. The total built-up area for this project is 306,000 sq. ft. and the total electrical load is of 7100 kW. The overall project is aiming to achieve the US Green Building Council (USGBC) LEED gold certificate.